My daughter has been in love with Monsters Inc for over a year now, after she saw Monster University her favorite character has been Mike Wazowski.She has a baby Mike Wazowski stuffed animals, a big Mike Wazowski stuffed animal and even a huge Mike Wazowski wall decal. 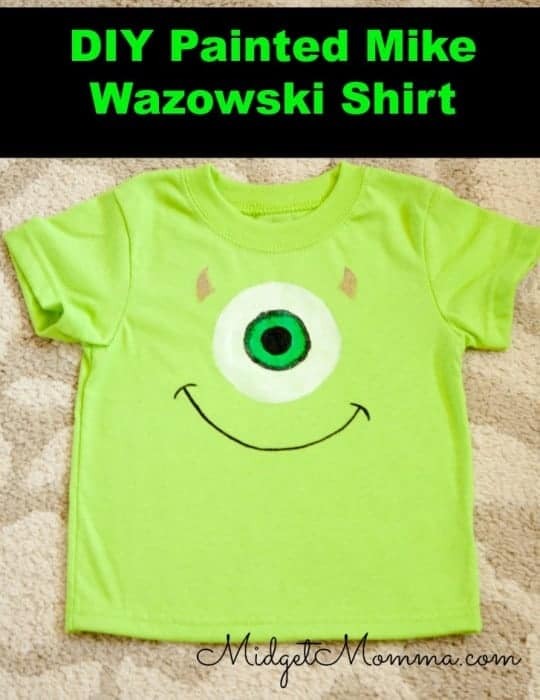 We are headed to Disney in May (actually a few days are the same time that Lauren will be there too) and I wanted to come up with a Monsters shirt for her, I wanted one that looked like him as a kid instead of when he is an adult so making my own was the best option. 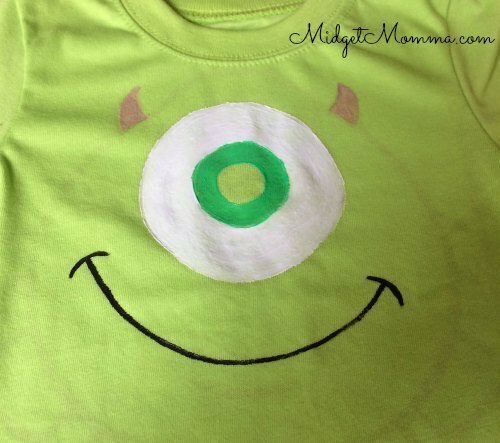 Making this DIY Painted Mike Wazowski Shirt was quite easy too and it did not take very long at all! 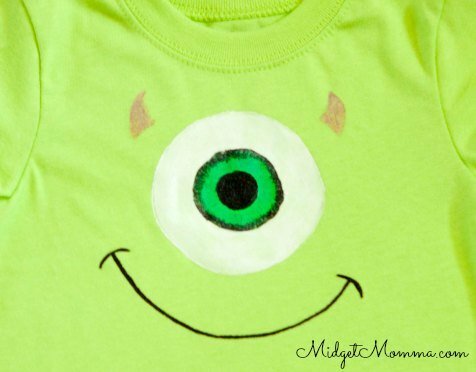 Make sure you also check out the DIY Sully Costume and the DIY Monsters Inc Boo Costume! You could totally make an awesome group costume! 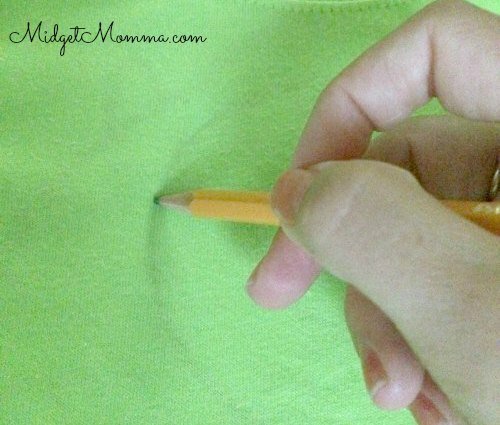 Place the print off in between your shirt. Using the pencil trace the outline of Mikes eye, mouth and horns. Remove the print off and cardboard in between your shirt. Using the medium brush paint the white of the out side of mikes eyes. 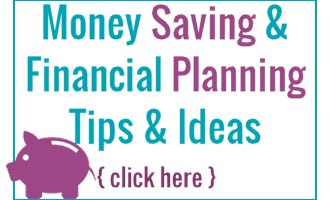 You will need to let the paint dry in between coats so you can get a bright white color. Next you will need your blue and green paint. Dip your small brush into the blue and the green paint, you want to build layers of color for the color of his eyes. Make outwards strokes on the middle circle of this eyes. With your small brush paint the insides of his eyes and his mouth black. Next paint a thin black circle in between the white and blue circle. While the black paint is still wet clean your paint brush and dip it in the blue and green paint. 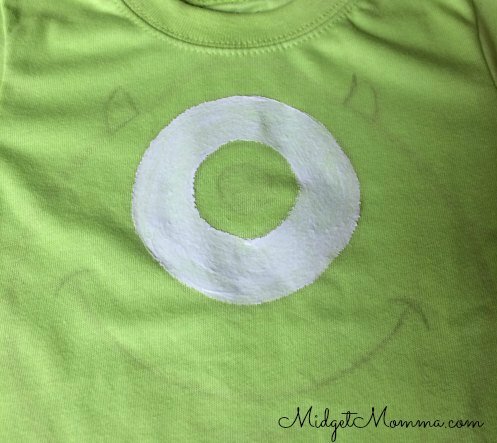 Blend the blue, green and black paint together by painting very small strokes from the black outer circle into the greenish blue eyes. Paint the horns with the beige paint. Let the paint dry over night.